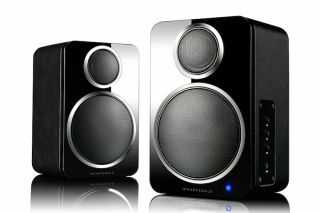 Wharfedale announces DS-2 desktop Bluetooth speakers | What Hi-Fi? The long-awaited successors to the Award-winning DS-1s aim to deliver even better sound-per-pound value. The DS-2s are based on the now-discontinued DS-1s (which took home a What Hi-Fi? Award as the ‘best desktop speaker under £200’ in 2015), but introduce a new design and a promise to deliver an “even better sound-per-pound performance”. Pretty miniature even for bookshelf speakers – they’re 19cm tall and 12cm wide – the two-way speakers are designed to sit on a desktop or table, connected to a smartphone, tablet or laptop either over an aptX Bluetooth connection or via its 3.5mm input. Beneath a 2cm silk dome tweeter is a 7.5cm mid/bass driver with a woven polypropylene cone, and at the back are rear-firing ports for helping low frequency performance. Unlike the DS-1s, they come with metal grilles for protecting the drive units. The master speaker features 30 watts (or 60 watts peak) of next-generation amplification, the aux input and volume and pairing controls. The DS-2s look just as friendly as their predecessors with their curvy-cornered cabinets and high-gloss finish (in black or white), but hope to win even more fanfare with leatherette side panels – smart indeed. At £180, the DS-2s may be pricier than the £130 DS-1s, but if the improved sound claim rings true, we don’t see why they wouldn’t be a serious contender for that desktop space either side of your laptop. We hope to find out for ourselves soon after their launch in March.